Jezebel staffers taking advantage of the general sense of peace and accomplishment that comes from a day at Jezebel. Images by Joanna Rothkopf. Last night Page Six celebrated the premiere of Page Six TV, but this afternoon, Jezebel celebrated another fun day in the Jezebel office. A crowd of more than 10 but less than 12 were on hand to celebrate yet another day of work at Jezebel at the Gizmodo Media Group Office and Kitchen Area, a sleek, concrete-wall and concrete-floored space in Manhattan, New York, the World. Water and a waning selection of just PG Tips tea flowed while staffers noshed on different kinds of garbage. Guests also danced to whatever autoplay ad they forgot to turn off, and Joanna’s Meditation for Insomnia track that she failed to subtly disable. Part of the staff of Jezebel—Kelly Stout, Madeleine Davies, and Clover Hope—enjoy themselves at the office, like they have before and they will again. 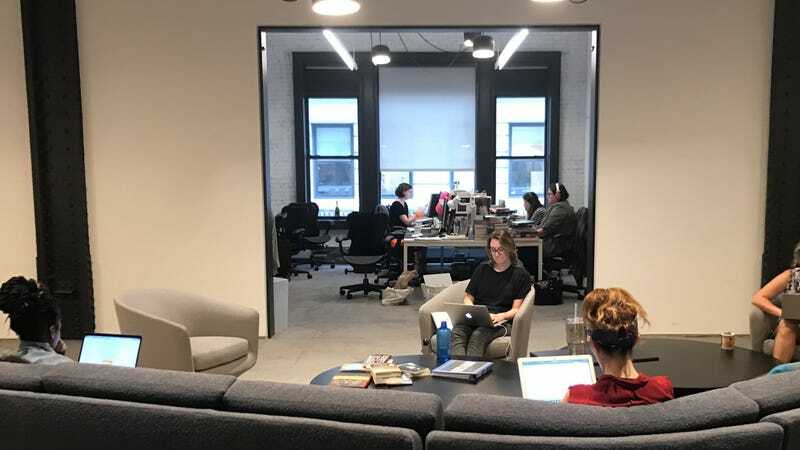 More Jezebel staffers—Megan Reynolds, Rich Juzwiak, and a portion of Hazel Cills’s head—enjoy the hip Gizmodo Media Group Office Jezebel pod, because it’s a pleasant workplace with a lot to offer. Four unoccupied chairs raise their arms in gratitude for another day at the temperate and stylish Jezebel pod. A desk covered in garbage shouts devotionals to God for the opportunity to serve her through blogging at the stylish Jezebel pod. Read Jezebel at Jezebel.com or go to Twitter.com/Jezebel and then click on one of the links and it will bring you to Jezebel.com.